This is the first draft of my contents page for my magazine. The contents page is laid out well. This means that it is extremely east to read and follow, which make the magazine much more user friendly. Everything is well aligned. This makes the document look extremely professional. I have been consistent with the use of colours and font styles, meaning that users can instantly recognise that this is my magazine by just looking at this page. The type of language that I have used will appeal to my target audience. It is quite informal and talks to them directly, for example, "New band DAZZLE offer you the chance to see them backstage!" I feel that the main focus of this contents is the guitar, yet this story was not even on the front cover. That is why I feel that this main focus of the page should be on a main feature within the magazine. Also, my magazine focuses more on artists, whereas by having both images of instruments may give the wrong impression and make readers feel that it is more of a magazine about instruments. I have not listed the stories about the instruments in my list of features. This may leave the viewers feeling as if they are not well informed, which makes the document unprofessional. The word 'features' looks far too plain and uninteresting, which would not appeal to my younger target audience. I need to either change the font, or add an effect to it such as a shadow or bevel, to make it attract more attention and look more visually interesting. You have so many pictures, it is a shame you do not use them here. It does not matter if you are reusing them from other pages. Furthermore, this page is screaming out for artist photo's. 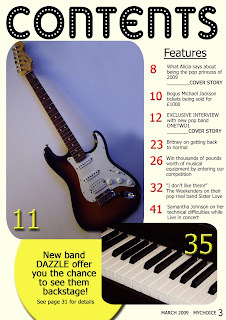 Due to the large image of the guitar, it looks like a contents page for a musical instrument store magazine. This is your chance to use more images. For a bit of inspiration, take a look at the couple of samples on my blog. Maybe pick a different font for "Features" as it is a bit standard. New Band Dazzle bubble could be a band image with a yellow outline instead of the yellow bubble.